A jacket was hung on the corner of a shelf that had vegetables stored on it. The top shelves closest to the condenser unit in the corner of the room were soiled with debris. Boxes of liquor were stored on these top shelves. On 17 February, a crew member reported having 1 episode of diarrhea and stomach cramps that were above normal to him. Although the medical staff deemed this individual incorrectly as a nonreportable case, the crew member was isolated appropriately by the staff as a precaution. The log form for bunkering instructed to record pH measurements every 4 hours. Even though the instruction was contrary to the 1-hour requirement, all reviewed records had hourly pH measurements during bunkering. The list of backflow prevention devices listed a backflow prevention device for the coffee machine in the engine changing room. However, the coffee machine and backflow prevention device were removed from this place. The bridge toilet did not have a sign advising users to wash hands and did not have hand towel, paper towel, or tissue with a sign advising users to use either to open the door upon exiting. All deficiencies were corrected. Potable water tanks 8, 9, 10, and 12 were cleaned and disinfected in September 2014 according to the records. Previous maintenance was conducted in September 2013. The record review found that only some documentation of what was done was available. Specifically, (1) tank 8 was cleaned, painted, and disinfected but there was no documentation on how it was cleaned, what paint was used, paint drying and curing times according to an unknown temperature in the tank, chlorine concentration and contact time during disinfection and chlorine concentration before putting it back in service; (2) tank 9 and 10 were cleaned and disinfected but there was no documentation on the chlorine concentration before putting them back in service; and (3) tank 12 was cleaned and disinfected but there was no documentation on how it was cleaned or the chlorine concentration and contact time during disinfection and chlorine concentration before putting it back in service. Potable water tanks 8 and 12 were cleaned and disinfected in September 2014 according to records. However, the chlorine concentration and contact time during disinfection was not documented. The serving utensils to the bottom left of both candy displays touched the display wheels when hanging from their attached cords. The wheels of the candy displays were soiled. The perforated deckhead panels above the candy displays were open to the plenum. The braided metallic water hose of the espresso machine was rough and not easily cleanable. This was reported as corrected by the staff but not verified by the inspector. Water was leaking onto the mechanical dishwash machine from a deckhead panel above the rinse compartment. Staff stated it was a condensation issue. The light fixture on the deckhead above the final rinse compartment was loose. The deck between the galley entrances and the revolving doors leading to the dining room was carpeted. The carpet was worn and stained in several locations. Staff had identified this item before the inspection on 10 February and was in the process of ordering tile to replace the carpet. The light intensity in front of the storage shelving at the far end was less than 220 lux. A previously cleaned deli slicer was stored with food debris on the recessed ledge on the back plate. Several previously cleaned plates and bowls stored in different stacks in the right undercounter cabinet under the coffee machine were soiled with food debris. Both undercounter cabinets under the coffee machines were soiled with coffee grounds and other food debris. Previously cleaned plates and bowls were stored in these cabinets. The light shield covering the light bulb on the right side in the second compartment of the far right deck oven was cracked. Mops, brooms, and dust pans were stored on the bulkhead. No cleaning locker was available for storage. According to staff a cleaning locker was scheduled to be installed during the December 2015 dry-dock. A gray hard plastic trolley used to transport clean plates out to the service line was cracked in two places making it difficult to clean. The sides of the trolley were also scratched and scored in several areas. The data plate on the mechanical dishwash machine listed the pressure for the final rinse as 'Minimum 20 psi.' It was later determined that the final rinse pressure for the machine should be 20 +/- 5 psi. This was reported as corrected by the staff but not verified by the inspector. The light intensity at the passenger self-service coffee stations was less than 220 lux. Absorbent rope was used to hold stacks of soda cans in place during the voyage. Food employees were cooking individual orders of stir fry that included either raw chicken, steak, or shrimp. Several orders were observed during the inspection and no final cooking temperatures of the chicken, steak, or shrimp were taken by the staff. The inspector took the final cooking temperature of two orders, one steak and one shrimp, and both were above 160°F. Both food employees cooking the stir fry had bimetallic stem thermometers but no tip-sensitive thermometers to accurately measure the final cooking temperatures of the small portions of chicken, steak, or shrimp. The supervisor of the area had a tip-sensitive thermometer but no final cooking temperatures were observed being taken. The light intensity behind and around the ice machine was less than 110 lux. The 4-hour report submitted for the voyage ending on 29 July contained the same numbers of reportable passengers and crew that were listed on the 24-hour report submitted hours prior. 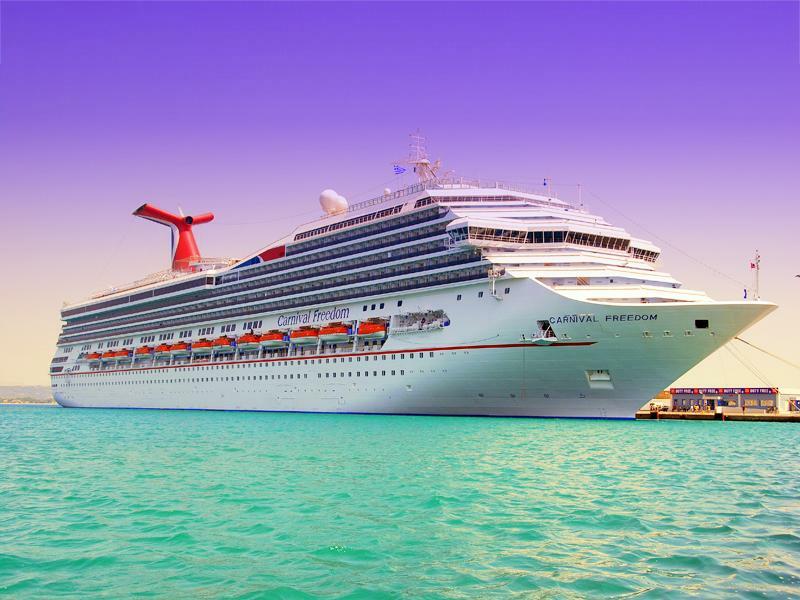 A review of the acute gastroenteritis (AGE) log for the voyage showed that one additional passenger reported having four episodes of diarrhea and no underlying illness after the 24-hour report was submitted. Anti-diarrhea medication was dispensed and a note was made in the electronic medical database that the symptoms were above normal for the individual. However, the individual was not recorded as a reportable case in the electronic medical database. As a result, the passenger was listed as a nonreportable case on the AGE log and subsequently was not included in the total number of reportable passengers on the 4-hour report. The wash temperature of the in-use rack-type warewasher was 140°F in the wash tank. The data plate required a minimum wash temperature of 150°F. This was corrected. A deckhead panel above the soiled drop-off counter was heavily soiled with dust. This was corrected. The previously cleaned food slicer had a slight build-up of food residue under the slicer's backplate next to the exit path of the food from the slicer blade. The deck was carpeted. This was corrected. The bulkhead-mounted telephone was soiled. This was corrected. 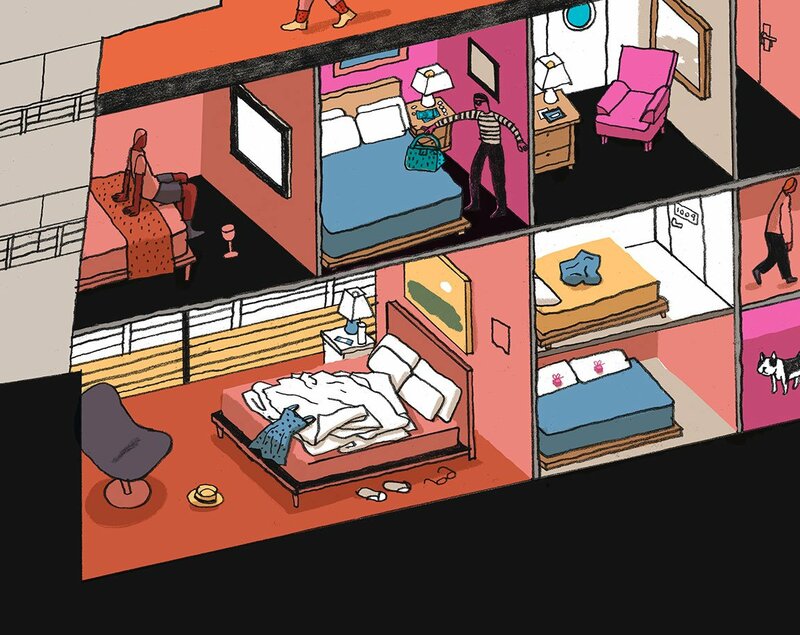 Five upright refrigerators had no top covers for their technical compartments. The compartments were open collecting dust from the surrounding deckhead vents. The technical compartments of the five upright refrigerators were heavily soiled with dust. This was corrected. The deck under the deck-mounted self-service ice cream machine was made of wood. Also, the deckhead was not smooth and was soiled with dust. The top panels of both rotisserie ovens were heavily soiled with grease by the exhaust vents. The ovens were previously cleaned and were not in operation. This was corrected. The deckhead panels above both rotisserie ovens were soiled with grease. The oven area was previously cleaned and was not in operation. This was corrected. The light intensity could not be raised to 220 lux for cleaning operations at the aft and center waiter side stands. The light intensity was less than 220 lux at the center cold food counters. Also, the light intensity could not be raised to 220 lux for cleaning operations at the waiter side stands. The dispensing ports of both previously cleaned juice machines were soiled with juice residues and debris. This was corrected. The plastic deflectors in front of the cuber panels of ice machine #2 were slightly soiled with dark and pink materials that appeared to be mold. This was corrected. Both levers of the water dispensing unit were heavily soiled with a dark material. This was corrected. The wash temperature of the in-use rack-type warewasher was 146°F in the wash tank. The data plate required a minimum wash temperature of 150°F. This was corrected. Wet mops were stored in a position that did not allow them to air dry. This was corrected. Both wine cellars had bulkhead-mounted bulletin boards made of cork material that was difficult to clean. This material was stained and looked soiled in some areas. The boards were removed. Upright refrigerators #34 and #35 had no top covers for their technical compartments. The compartments were open collecting dust from the surrounding deckhead vents. The technical compartments of upright refrigerators #34 and #35 were heavily soiled with dust. This was corrected. The four not-in-use bread toasters were heavily soiled with crumbs on the food contact surfaces. The power lines behind the bread toasters had ribbed covers that were difficult to clean. The power lines behind the bread toasters had ribbed covers that were heavily soiled. The drain of the hot chocolate machine had a ribbed cover that was difficult to clean. The table headings of the cooling logs instructed to record the cooling temperatures 'after 2 hours', 'after 4 hours', and 'after 6 hours' from the staring cooling time. It was discussed with the staff that this wording could be confusing stating that, for example, any time after 2 hours and before 4 hours was ok to check and record temperatures. Staff changed the cooling log form replacing the word 'after' to 'within'. No entries appeared to be incorrect on the inspected logs. The frame cover of the deck-mounted Hobart mixer had slotted fasteners in the food splash zone. There were other deck-mounted mixers in the area. The left light bulb was exposed and not shielded on the top oven compartment of the deck oven. The upright refrigerators had no top covers for their technical compartments. The compartments were open collecting dust from the surrounding deckhead vents. The technical compartments of the upright refrigerators were heavily soiled with dust. This was corrected. Three upright refrigerators had no top covers for their technical compartments.The compartments were open collecting dust from the surrounding deckhead vents. The technical compartments of the three upright refrigerators were heavily soiled with dust. The bulkhead-mounted bulletin board was made of a cork material that was difficult to clean. The material was stained and looked soiled. The door of the ice machine could not open completely unless hitting the plastic cover of the adjacent fire extinguisher. When closing the door, the inner part of the door hit the fire extinguisher. The fire extinguisher was temporarily removed. The deckhead above the bread toaster was soiled with dust. This was corrected. There was no sign advising users to use a hand towel, paper towel, or tissue to open the door. This was corrected. Water was pooled on the deck. This was corrected. The deck under the back bulkhead racks was soiled with liquid, olives, and debris. This was corrected. On the clean storage racks, two plates were found soiled with food residues. These plates were taken to be rewashed. A crew member that reported to the medical center with stomach cramps and no other symptoms was listed as a reportable case. There were no notes as to why only the stomach cramps made this case reportable. Several of the shelves were soiled with dirt, dust, and debris. The potable water hoses normally stored in this locker were in-use at the time. The shepherd's hook was not long enough to reach the deepest part of the pool from the side plus 2 feet. Excessive condensation was observed above the pot and pan dishwasher. Condensate was dripping from the deckhead to the deck in front of the machine. No clean ware was being impacted. The ceramic deck tile to the left of kettle #3 was broken and pitted making it difficult to clean. The upper manifold final rinse did not reach 180°F after a couple warewashing cycles. The bottom manifold was reaching 180°F. The upper manifold was cleaned by the engineers. One live fruit fly was observed in the room service pantry area by the cleaning locker. The drain under refrigerator E-4-S was clogged and standing water was observed. Management stated a work order was in place. An accumulation of dirt and debris was noted on the decks underneath the shelving units and on the bulkhead coving between the shelving units on the right side of this store room. Management addressed this immediately. One live fruit fly was observed above the port potato peeler. Pest management was notified. The handwashing sink only supplied hot water when the inspector washed his hands. The cold water supply line valve was turned off below the sink. The plumber turned the cold water valve on and corrected the violation. One live fruit fly was observed in the seafood prep room. The back counter and bulkhead was soiled with dust behind the Scharf espresso machine. The area was cleaned immediately. One live fruit fly was observed above the bartender station. The turnover rate for the water park, which was less than 24 inches deep, was 63 minutes. Two stacks of clean plates stored in a brown trolley were observed not covered or inverted. Also, the trolley was placed against a soiled bulkhead and below a phone for crew members. In order for crew members to use the phone they had to come into contact with the clean plates. The rat guard on one of the mooring lines was installed improperly which created a large gap that a rodent could easily fit through between the rat guard and the mooring line. The rat guards were not installed over all of these mooring lines or they were installed in a way that made them ineffective. A worker was observed using a sponge roller mop with a long handle to clean the starboard side of the ship and wiped the same mop along the forward potable water lines while in the process of bunkering. The pH of the mid-ship bunkering sample line was 8.23, 'Hi', and 8.13, as measured by the inspector, and 8.40, 8.40, and 8.12, as measured by the ship's staff. According to the ship's bunkering records, the pH of the shoreside bunker sample was 7.7 and was between 7.5 to 7.7 during the first couple of hours of bunkering. The staff added acid and adjusted the pump to try and lower the pH. The pH of the forward bunkering sample line was 8.15, 7.86, and 7.27 as measured by the inspector and 8.28, 7.96, and 7.81 as measured by the ship. The pH measurements of 7.27 (by inspector) and 7.81 (by ship's staff) were conducted several minutes after the staff added acid and adjusted the pump. The accuracy of the inspector's testing equipment was 0.1. The tank was not sampled by the inspector. An entry on the cross-connection log stated there were 'flexible hoses' in the deck 12 spa (ceiling) andl listed one N9 backflow prevention device. According to the staff, they did not know where this device was located or what it was used for in the spa. There was not enough space on either side of the deck-mounted ice machines to access or clean the back of the ice machines in the main deck 5 forward ice pantry and the deck 4 Riveria forward ice pantry. For example, only seven inches were available between the sides of the ice machine and the left and right bulkhead, but not all of this space was accessible due to the handle for the ice scoop on the right side of the machines and the drain lines on the left side of the machines. The 4-hour MIDRS report stated zero reportable crew cases with AGE and one reportable passenger case with AGE, but the AGE surveillance log contained different information. According to the AGE surveillance log, one reportable crew case with AGE and one reporatable passenger case with AGE were documented at the time the MIDRS report was submitted. A food worker reported two loose stools on February 7 at 0530 and was given antidiarrheal medication, but was recorded as a nonreportable case on the AGE log. According to the medical staff, it was unknown if this person was asked if their symptoms were above normal and there was no documentation. This crew member was isolated for 48 hours. During two cruises (February 6-11 and February 11-16), two out of three crew members with AGE did not have all of their close contacts interviewed. Staff was unable to verify this information. Documentation was available for their roommates and if they shared a bathroom with another crew member, but it was unclear if other close contacts were contacted and interviewed by the medical staff. This item was noted on the previous inspection, but documentation was provided for other crew members with AGE indicating all their close contacts and interviews. On February 22, a person was indicated as a food worker that had an illness onset at 1900 and reported two loose stools and abdominal cramps. According to the medical staff, their symptoms were above normal and antidiarrheal medication was dispensed, but the person was indicated as nonreportable on the AGE log. The underlying illness column stated 'nil of note'. This person was only isolated for 24 hours, but medical staff later confirmed this person was actually a nonfood worker. When pests were discovered and documented in the active surveillance log, it was unclear if any insect activity was identified after the follow-up inspection and/or treatment was conducted. For example, on February 22 and 23 fruit flies were observed in the WOS restaurant, but the log indicated no insect activity was found during the follow-up inspection and stated 'No (2/23/14)'. According to staff, the '(2/23/14)' indicated the actual treatment date and the follow-up inspection was actually conducted the following day on 2/24/14. It was confirmed there were no pests found in this area during the follow-up inspection. Under In the grill / fryer counter hot cabinet #8 and along the deck / bulkhead seam under the cabinet, particularly behind the legs, heavy accumulations of old food soil were noted. Similar cleaning problems were found on the port side grill. The long tape bundled yellow electrical cord to the hot display unit #4 was frayed. The long tape bundled yellow electrical cord to the hot display unit #4 was soiled. The submitted light work plan is still in progress on increasing the light levels on the food and beverage counters for increasing the light intensity to 220 lux. The light currently ranges on the counters checked today was between 110 and excess of 220 lux. One house fly was noted on the closed plastic bread box. A long profile strip extending from the cold wells on both sides of the soft serve dispensers had a difficult to clean open gap at the top seam. Repairs commenced while the inspection team was still in the area. Food soil was noted in the gap between the counter top and the long profile strip extending from the cold wells on both sides of the soft serve dispensers. An open seam was noted along the top of the coving tile and adjacent bulkhead under walk-in cooler evaporator drain line in the port side pantry. The bulkhead panel was damaged behind the trolley storage in the aft end of this galley. An open seam was found at the bottom of the bulkhead panel. A difficult to clean area between a conduit near the deck and along the bulkhead was noted to the right of the starboard fry station. Old food soil was noted in this space. The ceramic tiles around the station were broken and pitted making them difficult to clean. The submitted light work plan is still in progress on increasing the light levels at the waiter stations for increasing the light intensity to 220 lux. The light currently ranges on the counters checked today was between 110 and excess of 220 lux. An opening was noted in the end of a profile strip between the salamander stack and the adjacent flat grill near the bulkhead that could allow grease and food soil to seep down below the counter where the grill was mounted. Old food soil was observed on the bulkhead and deck below the gap mentioned above. A difficult to clean rusty steam pipe was found behind kettle 5. Food soil was noted on the pipe. A longstanding water leak was noted seeping out of the bulkhead deck coving seam behind kettle #3. The evaporator drain line for walk-in cooler #A51F was missing a flange where it penetrated the bulkhead. Repair was made while team was still in the area. The deck was severely damaged and difficult to clean under the cereal shelving in Store Room #2. The three compartment sink rinse and final rinse sanitizing solutions were both covered with a light film of grease. A live fly was observed landing on the top of the juice reach-in cooler. The fly was eliminated while team was still in the area. A channel with holes in the top had been added to hold the cords up on the back bar behind the espresso machines and other items on this counter. The channel had an accumulation of dust in it. Old coffee beans were spilled along the top of the channel. One small fly was noted around the waste container on the counter where the used sugar packets and creamers were discarded. The port side pantry had an ice machine draining onto the deck on the right back corner. Algae was noted around this leg and water was pooled between the leg and the scupper drain. The walk-in cooler #10-315 had a drain line penetrating the bulkhead that was missing the bulkhead flange. Drain line was also leaking water at the joint where plastic pipe had been used between the metal sections of the drain line. Although the medical staff documented clearly whether or not there was a cabin mate of any crew member with reportable gastrointestinal (GI) symptoms, they did not document whether or not there were any other immediate contacts to the reportable GI ill crew members. There was no backflow prevention device installed on the flexible shower hose in the bathroom of passenger cabin R-55. The hose was long enough to reach the deck and the toilet bowl. Staff installed a backflow preventer on the shower during the inspection. Repeated manual tests were made using both the ship's test kit and the inspector's to check the calibration of the chlorine analyzer on the bridge. In all the tests the manual tests were 0,4 ppm below the analyzer reading. The analyzer was re-calibrated immediately. The heating ventilation and air-conditioning fan units all had sight windows fitted on one side of the exterior door panel which gave a view directly beside the internal cooling coil to what appeared to be a condensate collection pan channel. Upon closer inspection this channel was not in fact draining and the actual condensate collection pan was below the fan coil and not clearly visible thru the several small holes along the left and right side of the fan coil because these holes were obstructed by a partial metal strip installed below. An attempt was made using a fiber optic cable to view the interior of the condensate collection pan thru the holes on the side of the fan coil, but it was very unclear. The shower in this area was not listed among air-gaps on the backflow prevention log. Upon inspection it was noted that the flexible shower hose was long enough to reach the deck below and no backflow prevention device was installed on the potable water connection to the shower hose. The staff noted that the hose was not installed correctly and should have passed thru a fixed metal loop at the top of the shower wall which provided the necessary air-gap. This was immediately corrected. Near the end of the inspection two portable tables with steel chafing dishes were being loaded with foods for a wedding reception. Only the center section where cold items were served had a portable sneeze shield installed to protect the food. Guests were serving themselves at these tables and many food items viewed from a distance were not shielded. Staff brought servers to the area immediately. Water leaked from the underside of the soiled end of the dishwash machine. Staff stated the drain was blocked which caused the water to pool on the deck. The light intensity was less than 220 lux in front of the beverage equipment and less than 110 lux between and behind the equipment. A work order had been placed on 1 August 2012. The light intensity was less than 220 lux on the back right corner of the forward port flat grill. A light bulb above the grill was inoperable. During the inspection the light bulb was replaced and the light intensity was increased to 220 lux. The drain line from the handwash station was not directed to the deck drain, causing water to pool on the deck. This was corrected. The light intensity was less than 220 lux in front of combination oven #6 and on the preparation counter in front of the fire suppression system. Two deckhead-mounted light bulbs had been removed. The light intensity was less than 110 lux around the ice machines. A work order was placed on 17 July 2012. Numerous stacks of previously cleaned plates and bowls were stored upright on the tables. Staff stated these items would undergo additional inspection for cleanliness prior to use. The wash drain basket was soiled with a large amount of food debris and the final rinse drain basket was soiled with a small amount of food debris. The dishwash machine was in use at the time of the inspection. The light intensity was less than 220 lux at all areas of the preparation counters. A work order was placed. To the left of the blast chiller, there were gaps where the two freon lines penetrated the deckhead. During the inspection, staff installed stainless steel profile plates to close the gaps. The deck drain outside the produce cooler had red paint that was peeling and corroding. Numerous trays of cut lettuce were stored in walk-in refrigerator 3-255-F, but were not included on the cooling/blast chiller logs. Water leaked from the deckhead onto the deck next to the slicer. No clean items were impacted. The drain line from the far right hood system was leaking. At least 15 plate trolleys, at least 15 large plastic gray bins of soiled items, and numerous stacks of plates and plate covers were accumulated in the soiled area and outside the soiled area of the dishwash machine. This area was not in operation at the time of the inspection. Staff stated all of these items were washed and sanitized the night before during the dinner service and that all of these items would be rewashed today during the lunch service. At least 15 plate trolleys, at least 15 large plastic gray bins of soiled items, and numerous stacks of plates and plate covers were accumulated in the soiled area and outside the soiled area of the dishwash machine. Staff stated all of these items were washed and sanitized the night before during the dinner service and that all of these items would be rewashed today during the lunch service. Within the stacks of accumulated plates and plate covers, there was a mixture of soiled and cleaned items. Numerous items were visibly soiled and did not appear to have been washed. The wash basket was soiled with food debris. The dishwash machine was last used for the dinner service the previous night. The grease pan housings of flat grill #2 were soiled. The grease pan housings of the flat grills were difficult to clean. The deck drains below the three-compartment sink and the potwash machine had paint that was peeling and corroding. The deck drain below the mixer had paint that was peeling and corroding. In the written OPRP there was no concentration provided for the 5 minute contact time for the Vital Oxide disinfectant. According to the manufacturer's fact sheet, the concentration for the ready-to-use product is 2,000 ppm chlorine dioxide, so the plan should be updated to include that concentration value whenever listed. Additionally, there was a Food Operations Manager section in the Procedures for Returning the Ship to Normal Operations where it was stated to discontinue use of 1,000 ppm chlorine bleach and revert to solutions of 50-200 ppm. This should be removed as there is no use of 1,000 ppm chlorine solution specified or allowed in food areas. In both the outbreak notification letter to current passengers and the post outbreak norovirus letter for cruises following an outbreak, the statement that gastrointestinal illness is commonly referred to as stomach flu creates confusion. This wording should be removed from both letters to remove any confusion with influenza and gastrointestinal illness. There was no backflow prevention device installed on the flexible hose connection to the shower. The incubator was in use at the time of inspection and had an air temperature reading of 30-31°C. The manufacturer specified an incubation temperature of 35°C. Staff adjusted the incubator temperature during the inspection. The sanitizing solution on the deck below the two meat slicers had a chlorine concentration over 600 ppm. Staff immediately discarded the solution and remade a new solution. The moist wiping cloth on the counter between the two slicers was heavily soiled with large meat particles from wiping the in-use slicers, and was not placed in the sanitizing solution between use. The lights over the back bar bottle storage were not covered and the bulbs were not shatter-resistant. The braided steel water line below the rear panel of the espresso machine was draped on the counter, making cleaning difficult. Staff corrected this immediately. There was a heavy dust layer on the cables and tubing directly beneath the espresso machine. Staff cleaned these immediately. The light intensity could not be raised to at least 220 lux at the waiter stations and the soiled drop-off stations. A work order was placed on 1 August 2012. Staff stated they were working with the designers to install decorative lights. Technical compartments underneath beverage units and to pizza display units had soiled and corroded mechanical piping as well as soiled electrical cords. The back side of the fan to the condenser unit was coated with dust. Lighting at the self-surface coffee and juice beverage stations could not reach the required 220 lux of light. Lighting behind and around deck and counter-mounted equipment throughout the food service areas could not reach the required 110 lux of light. This was observed at the following locations: beverage stations, ice cream stations, and ice machines. A comprehensive plan to add lighting to these areas was observed and new lighting was also observed in several areas throughout the food outlets. A mop was observed stored in a mop bucket with dirty brown water. The deck tracks and the vertical tracks near the doors were soiled with food residue of more than a day's accumulation. There was missing and recessed grout between deck tiles and between deck tiles and stainless steel gutter ways and equipment mounts. The bulkheads had loose profile strips, loose flanges around bulkhead pipe penetrations, and other damaged areas. The damaged areas were primarily observed on the lower areas of the stainless steel bulkhead panel and deck tile junctures. The deck under the deck mounted food storage rack in the back corner was soiled with food residue of more than a day's accumulation. There were coils of excessive electrical cords to the beverage equipment located inside the technical compartments. The electrical cords were not soiled. The lighting at most waiter stations and soiled drop off stations in both dining rooms could not be raised to the required 220 lux of light for cleaning operations. A deckhead air supply exhaust vent above freezer A-40-F was soiled with dust. Approximately 10 trolley carts had soiled areas of dried food residue along the plate storage contact areas. Also, the wheels of the trolley carts were soiled with food residue. No plates were being stored in the trolleys. While examining the interior of the ice machine's technical compartment, a crew member placed the food contact side of the ice machine's plastic evaporator cover on an unclean surface and replaced it back in the ice machine without sanitizing. Plastic plate covers were being stored inverted on the top shelf along the hot galley service line which was soiled with an excessive amount of dust. The final sanitizing rinse temperature was measured at 168°F when measured with both the inspector's and crew member's thermometer at the in-use manual potwash. The mechanical gauge showed a reading of 173°F. The steam valve used to heat the water was in the closed position. The steam valve was immediately opened and the sanitizing rinse temperature reached 177°F before the operation resumed. Several continuous pressure backflow prevention devices connected on the potable water lines to juice and coffee machines were leaking from the atmospheric vent. These were observed at the main galley beverage station to the Celebration dining room and at the staff mess beverage station. The mechanical temperature gauge for the final sanitizing compartment was not accurate to within the required +/- 3°F. The inspector's and crew member's thermometer measured 168°F while the mechanical gauge showed a reading of 173°F. The sneeze guards at several areas of the self-service buffet were not adequately protecting food. This was observed at the hot holding and condiment display in the staff mess and also at the cold hold display in the officer's mess. The swimming pool had channel drains with standard drain covers. There was an alarm for draining in the engine control room, but not at the pool. The covers for the therapy pump suction fittings had approved antientrapment covers, but were less than 3 feet apart and there was no safety vacuum release system or automatic pump shut-off installed for any of the whirlpools. There were no chart recorders or electronic data loggers installed to monitor the halogen and pH levels in the pool or whirlpools. There were noncontinuous pressure backflow prevention devices installed on the potable water lines to the washing machine. This was corrected during the inspection. During bunkering, the pH was measured at greater than 8.4. The halogen level was measured at 2.7 ppm. There was both the official corporate OPRP and a draft version of a new OPRP plan available on the vessel. Neither version fully complied with the 2011 Operations Manual. Missing items included: concentration of HB Quat, contact time for disinfecting, and trigger points to start OPRP actions. Also, the draft version indicated links to example letters for informing passengers/crew of an outbreak and embarking passengers/crew of a previous outbreak, but these were not available for review. There were gaps between the decorative bulkhead material and the sides of the back bar counter and between the bulkhead material and the top of the lower coved bulkhead/deck tiles. There were slotted fasteners in the surface where the steam enters the ground coffee. There were also wires and pipes exposed in the splash zone above the coffee dispensing, milk steaming, and water steaming areas. The time control plan for the pastries in the cafe was a copy of the plan for the pastry area of the galley. The plan included the cafe pastry display as a location for time control, but the set-up and discard times for the cafe pastries were not included on this plan. Staff were not monitoring any of the 6 different RWF's for combined chlorine or total alkalinity. The recreational water facility logs were not clear in that bromine or chlorine is optional on the form for each facility (Br/Cl) and there was no indication on the log for each facility which was actually used as the disinfectant. The written draft OPRP had several areas where the various parts of section 9.1 in the VSP Operations Manual were not met. Specifically, the plan refers in many sections to frequent or time specific (every 30 minutes) disinfection of hand-contact surfaces in passenger and crew public areas during periods where the gastrointestinal illness (GI) is above 2% in passenger or crew. In many food related sections of the OPRP the chlorine concentration specified is 1,000 ppm. This includes galleys, pantries, bars, and the child center. In several cases where a disinfectant like HB quat or Vital Oxide are specified there was no concentration listed or dilution ratio (strength), and some had different strenghts recommended by the manufacturer for different surfaces. The housekeeping section of the OPRP listed procedures for crew member respiratory protection when disinfecting and fogging ill passenger cabins, but gave no similar protective procedures for passengers. Additionally, there were no material safety data sheets attached anywhere with the written plan for the different chemicals used. The draft letters to embarking passengers following a gastrointestinal outbreak were unclear in that they mention colds, flu and stomach flu along with gastrointestinal illness. Additionally, this letter is given only at the port terminal and not prior to the voyage day. The letter does not offer passengers the option to not sail on that voyage for public health reasons. The electronic database did not produce the standardized AGE log exactly as provided in annex 13.1.1 of the VSP Operations Manual 2011. This system was also still using the old definition of a gastrointestinal illness case, with regard to diarrhea, and it did not allow a person with 3 or more episodes of diarrhea to be non-reportable or those with less than 2 episodes to be reportable (unless accompanied by fever or vomitting. Lastly, the system did not provide for updating symptoms other than vital signs when follow-up evaluations were made and additional GI symptoms occurred. A bartender reported to the medical center with onset of GI symptoms (stomach cramps and diarrhea) in the early morning of 5 January. As there were only two episodes of diarrhea the individual was isolated and treated with antidiarrheal medications. At 5 pm the same evening this crewmember had additional episodes of diarrhea, but was still listed as non-reportable and released to return to work on 6 January. The two mineralizer air-gaps in the engine room were not listed on the cross-connection control plan and were not inspected. The additional signs required at the pool, whirlpool spas and water works interactive RWF to comply with section 6.7.1.1.1-6.7.1.1.3 of the VSP Operations Manual 2011 were not yet installed. Additionally, the turnover rates were not established for any of the RWF's and bather loads for each had not been determined. The main pool dual gravity channel drain was not alarmed to warn when the drains were opened, per section 6.7.1.2.2 of the VSP Operations Manual 2011. The door gaskets on many of the undercounter and reach-in refrigerators and hot holding units were worn. This made closing some of the units difficult and allowed warm air to enter the units. This was observed in the main galley appetizer, hot line, pastry, crew galley hot line, lido galley, lido pizzeria, and the Mongolian Wok. The light intensity was below 110 lux behind and around many pieces of deck- and counter-mounted equipment. This was mostly observed behind and around ice machines, deck ovens, and at the beverage stations. The right counter-mounted juice dispenser was soiled along the food splash area, as well as inside the right and the second to left dispensing nozzle. This machine had been previously cleaned and was not in use at the time of the inspection. The stainless steel profile plate on both of the evaporator drain lines were loose at the bulkhead, exposing gaps. There was one fly near the beverage station. This area was open at the time of the inspection. The top surface of most of the sneeze guards were soiled with dust. This was immediately corrected. The light intensity was less than 110 lux at the handwashing stations in some of the bars. Legibility of dates and values was poor in at least ten instances since last inspection. Additionally, bunker halogen residual monitoring on 01/01/2011 was recorded as '01/11/2011', but verified as 01/01/2011 against other bunkering records of shoreside testing. Evaluate need for backflow prevention at high saline discharge in reverse osmosis plant installed on this ship. Brown foam was noted on water surface, along the wall and overflow drains of both starboard and port Serenity whirlpool spas. Bromine levels, pH and temperature levels were acceptable. No passengers had been in the spas since they were drained and cleaned overnight. Crew reported that this was a regular occurance for the first hour of operation and were scooping and removing the foam at the time of the inspection. A brown scum residue was noted at water level for both spas. There was a greater than one day soil accumulation on the top exterior of the two counter model juice dispensers. Both were cleaned immediately. The in-use conveyor glasswashing machine's upper final sanitizing rinse spray arm did not extend fully over the right most side of the dishware racks, and the spray arm nozzle farthest right did not reach the right side section of the dishware rack. Deck tile grout was recessed and tiles were damaged and broken in places throughout the food areas. Deckhead attached supply and exhaust vent covers were damaged, missing screws, loose, or profile strips were loose and sealant was peeling from profiles and hoods in the galley areas. Attached speaker covers were loose and the surface paint peeling as well. All the Lang model ranges in galleys throughout the ship had a difficult to clean, long, wide, and deep void below the cooking top where the grease drip pan inserted. Some of the range grill grease pan housings had grease debris and soil present. The soiled grease pan housings were cleaned immediately. There was a gap present where food and grease were depositing on the side of the #2 range top where it joined the stacked salamander broiler beside. The gap was partially covered by a stainless steel profile strip, but the profile did not extend completely over the gap and there was one screw missing from the end section of the profile strip. There was an excessive amount of soiled sheet pans and other pans stacked over a meter high and positioned just opposite the interior section of the potwash. The line of stacked, soiled items extended past the potwash machine and at the end was a large stainless steel waste bin, which set within one meter of the clean pot rack and the clean pot landing table for the potwash machine. Time only as a public health control labels were taped on the top of the tilt braising pan filled with cooked veal stew, and the steam kettle containing cream of cauliflower soup as back-up for the buffet. There was no designation in the time only as a public health control plan that either cooking device was used for time only control of pathogens. Both were tested for temperature and both were well over the minimum 140 °F. The newly installed potato peeler had slot-head screws fastened into the upper, food-contact section of the unit. One live fruit fly was observed at the two self-service milk/cream pitchers at the end of the buffet line. When the undercounter technical compartment was opened, 8 more fruit flies were observed flying in and around the drain as well as the flexible drain hoses. Six live fruit flies were observed inside the buffet were bowls of raw red and green apples and oranges were presented for passenger self-service. Three fruit flies were observed crawling on the red apples, which were immediately removed for re-washing. The remaining fruit was also removed. One live fruit fly was observed in the pantry during service. There was heavy dust soil on the pizzeria sign hanging directly over the service counter. The dust was on all surfaces, including the chains used to hang it from the deckhead. A number of the previously cleaned plastic cups were found stacked wet on the beverage station line. The glasses were immediately removed for air-drying. There were two live fruit flies circulating in this pantry. The bar was in operation at the time of inspection. The door to the pantry was pinned open during service, and there was no mechanical device to restrict access to pests. The power cable to the countertop bottled drink refrigerator was coiled on the counter below, making cleaning difficult. The ice scoop was observed lying in the ice with the handle touching the ice at the front bar counter model ice well. There was missing and recessed grout between deck tiles and between deck tiles and stainless steel gutter ways and equipment mounts. The bulkheads had loose profile strips, loose flanges around bulkhead pipe penetrations, and other damaged areas, especially on the lower areas of bulkhead panels. The non-food contact surfaces of equipment had damaged surfaces, gaps, seams, missing fasteners, and other difficult to clean features. There were portable Alto-Sham heat lamp units used for pastry display and self-service in at least 3 locations. The sneeze guard was not low enough to protect the front baskets of pastries. The sneeze guards are to be extended in the next dry dock. Below the display case by the entrance, the stainless steel panel at the bottom of the bulkhead did not extend the full length of the bulkhead. Also, the pipe penetration into the blue tiled area of the bulkhead was not sealed completely. The deck/bulkhead juncture was not coved along the bulkhead with the entrance door. In the technical compartment below the utility sink on the back counter, the two pipe penetrations in the back of the compartment were not sealed. Under the preparation counter to the left of the fryer, the bulkhead was not finished, was very rough and had a small hole in the surface. Staff stated that this area was on the dry dock list to be repaired. There were three flies noted on the upper shelf. This part of the galley was not in use. There was a gap between the bulkhead and the left side of the salamander. The thermometer in the incubator cabinet had hash marks but no numerical indicators and the indicator liquid was below the lowest hash mark. The bacteriological test kit instruction guide indicated that the incubator temperature should be 35°C +/- 0.5°C. There was a bacteriological specimen bottle in the incubator at the time of the inspection. A new thermometer was installed and the temperature was at 35°C. The "potable water only" stenciling at each connecting end was faded on some of the hoses. The intermediate atmospheric vent of the backflow prevention device on the fresh water transfer pump was sealed. This was corrected. The cove tiles and plumbing lines along the bulkhead below the blended drink counter were soiled with a black material. There was a gap at the deck juncture with the short bulkheads on either side of the dessert cooler. The space below these bulkheads were soiled with food and debris. There was no coving at the deck juncture with the short bulkheads on either side of the dessert cooler. There was insufficient lighting at the front counter above the dessert cooler and on the left side around the preparation sink. In several locations the deck for food preparation and storage areas were difficult to clean due to missing tiles, recessed grout, broken tiles and damaged grouting/stainless steel bulkhead junctures. In addition, the painted surface for deck drains/scuppers were rough and difficult to clean. The latch for the meat thawing freezer was broken. According to the staff, a work order had been submitted to repair the latch. The blast chiller for the meat preparation area was out-of-service. According to the staff, the blast chiller had been out-of-service for at least 6-months and they do not use the chiller for any preparation operations. The food contact and non-food contact surfaces of the meat slicer were soiled with dried food debris. The underside of the slicer was also encrusted with debris and grease. The gasket for the hatch leading to the technical space in the fish preparation area was degraded and the bulkhead was damaged. A bicycle lock was attached to a food trolley holding raw marinated chicken. The lock had contact with the raw chicken. A tray of raw chicken on a trolley was exposed and did not have a protective covering. This item was corrected. A trough drain between the rinse and sanitize compartments of a three-compartment sink was clogged with food residue and debris. This area was not in use at the time of inspection. This item was corrected. The sanitation compartment of the 3-compartment sink was soiled with food debris. This item was corrected. Four small flies were observed in the potato peeler in the vegetable preparation room. This area was not in operation. A single large fly was observed in the meat preparation area near the meat slicer. This area was not in operation. A pan of raw ground beef was stored over a pan of raw whole intact beef. This was corrected. A plastic bin of bread was stored on top of a bin of open bags of frozen peas. The peas were in direct contact with the bottom of the bin of bread. There was also a bin with a bag of frozen broccoli that was not covered. These items were corrected. The waste receptacles for the handwash stations were missing at the fish preparation station, the trolley wash and the handwashing station across from frozen bread storage. Milk for the espresso machines in the staff and officer buffet was on time as a public health control, but the milk containers were not labeled. The time as a public health control plan did not indicate milk was on the plan. The hours of operation for the buffet are greater than 4-hours. The deck/bulkhead juncture was not coved behind the buffet line. The waiter station was not coved at the deck/bulkhead juncture. There was a gap between the top and sides of the deck mounted waiter station and the bulkhead. Two cans of Sterno were stored in the technical space of the cold hold unit on the buffet line. This item was corrected. The metal deck drain on the soiled side of the flight-type warewashing machine had large gaps that were not sealed. Single use items such as stir sticks and chop sticks were stored on the same shelves as non-food items such as office supplies. Also, there were three open containers of wooden cooked meat labels. Chemicals such as Sterno, WD-40 and sealants stored in the same space, but on a lower shelf. The clean-in-place mixer was soiled with grease and other food debris along the base of the mixer. This item was corrected. Condensate was dripping from the underside of the counter on top to food in the bain marie. The food was discarded. An excessive amount of condensate was collecting on the underside of the counter above the bain marie units on the hot line. There was no drain line for refrigerator A-40-F. Condensate water drained directly to the deck. The forward buffet line was missing a side sneeze shield (across from the toaster). A work order had been submitted to replace the shield. Serving utensils were not provided for the beans on the salad bar and the handle for the pasta was in contact with the food. This item was corrected. Two small flies were observed in the hot hold display unit. The unit was empty and the service area was not in operation. A bucket of sanitizing solution was measured at greater than 200 ppm. This item was corrected. A small amount of condensate was observed collecting on the sneeze shield for the hot hold unit. Food was present at the time of inspection, but condensate was not dripping. The bulkheads were damaged in several areas in the provision walk-in units, there were also gaps and seams and the bottom of bulkheads throughout the food service areas and along the vertical profile strips. The Watts 288A backflow prevention device on the potable water lines to the hood cleaning systems was located before the solenoid valve. This device is intended for non-continuous pressure applications. There was a non-continuous pressure backflow prevention device on the hose connection. There was a valve at the end of the hose. Also, this connection was not listed on the cross-connection control plan. This was corrected. There was no backflow prevention device on one of the two hose connections. This was corrected. There was no backflow prevention device on the potable water line to the coffee machine. There was no way to exit the interior door without touching the door handle with bare hands. Deficiencies (found in 17 inspections). 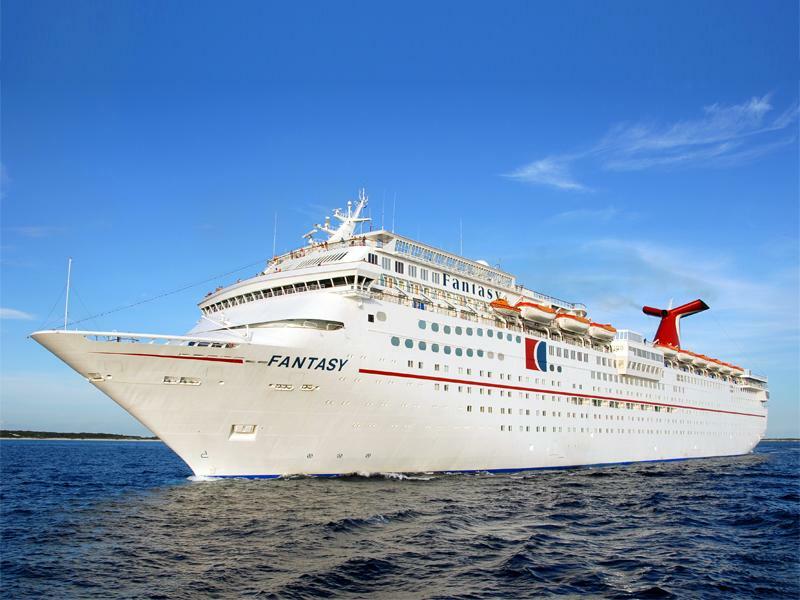 On 13AUG14, the 855ft Panamanian flagged cruise ship CARNIVAL FANTASY (IMO #8700773) departed Union Pier, Charleston, SC after embarking passengers for a five days cruise. At approximately 1630 while transiting the Charleston harbor channel, a passenger was walking aft on the Promenade deck heading towards the Majestic Bar. 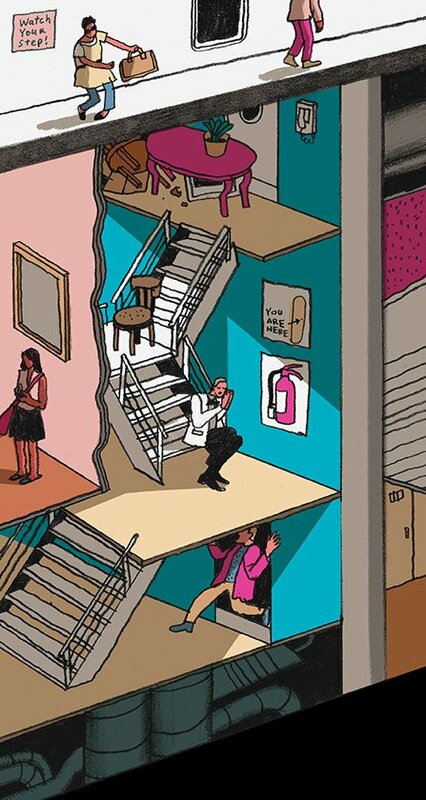 While transiting between fire doors, the passenger did not recognize the stairs ahead, falling down two flights. The vessel's medical team responded to the scene and provided initial first aid. The passenger was transferred to the vessel's medical facility where the onboard doctor diagnosed a broken patella on the left knee. The vessel returned to Charleston where the passenger was offloaded to EMS where he was transferred to a local hospital for further treatment. Theft in the offices of the art auction deartment on the ship. Subject detained by U.S. Customs. On 16SEP13, the foreign passenger vessel CARNIVAL FANTASY (O.N. 8700733) was moored at the passenger terminal on the Cooper River in Charleston, South Carolina. At approximately 1300hrs, a passenger lost her balance and fell from a bar stool on the Lido deck and fractured her left wrist. An x-ray from the vessel's medical clinic revealed a fracture to the left wrist. The passenger disembarked the vessel while in Charleston for further medical treatment. The medical diagnosis was a distal radius fracture to the left wrist. There are no indications that drugs or alcohol use were causative factors; however, drug and alcohol testing was conducted post-casualty as the injured party was a passenger and not subject to post casualty testing requirements. The incident was not reported until the vessel's staff captain sent an email with attached CG-2692 on 18SEP13 to Sector Charleston. 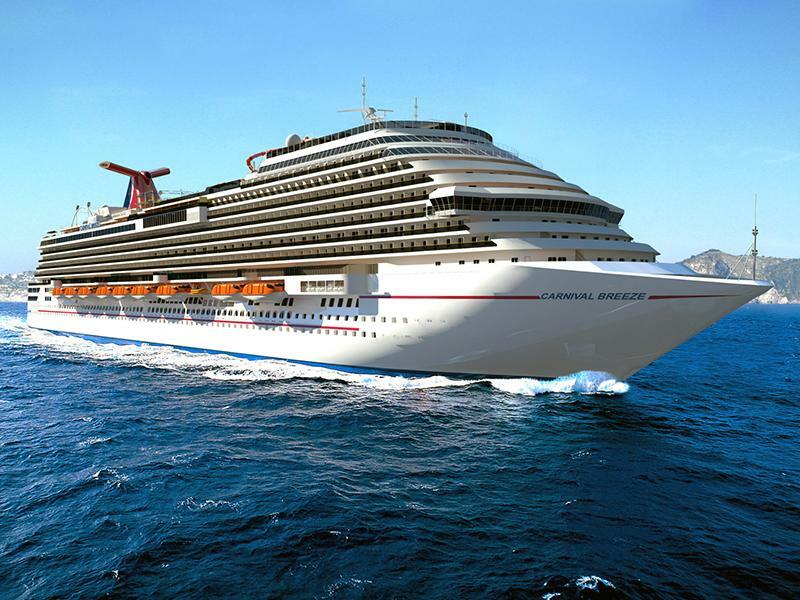 SEC CHS RCVD a report of a passenger with a head injury on board the Carnival Fantasy. Ships doctor is requesting a MEDIVAC. Passenger fell on stairs injuring head, left hip and left knee. 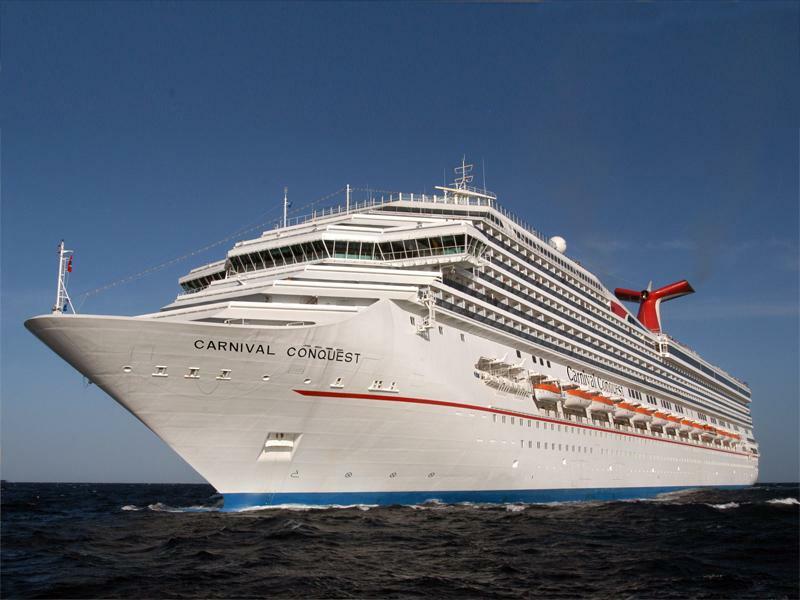 On 10 June 2012 at approximately 0020 hrs a male passenger on the CARNIVAL FANTASY (ON 8700773), a 855 foot foreign passenger vessel, fractured his right ankle while jumping over furniture playing a game while the vessel was transiting off the coast of the Bahamas. The passenger was playing a game of "capture the flag" in the Universe Lounge, upper level, on deck 09, starboard side. While trying to avoid another player, the passenger jumped over the backrest of a couch where his right foot became lodged between the couch and the wall. The passenger was treated by the ship's medical staff for a fracture to the right ankle. The passenger completed the voyage and departed the vessel when it arrived in Charleston, South Carolina on 13 June 2012. 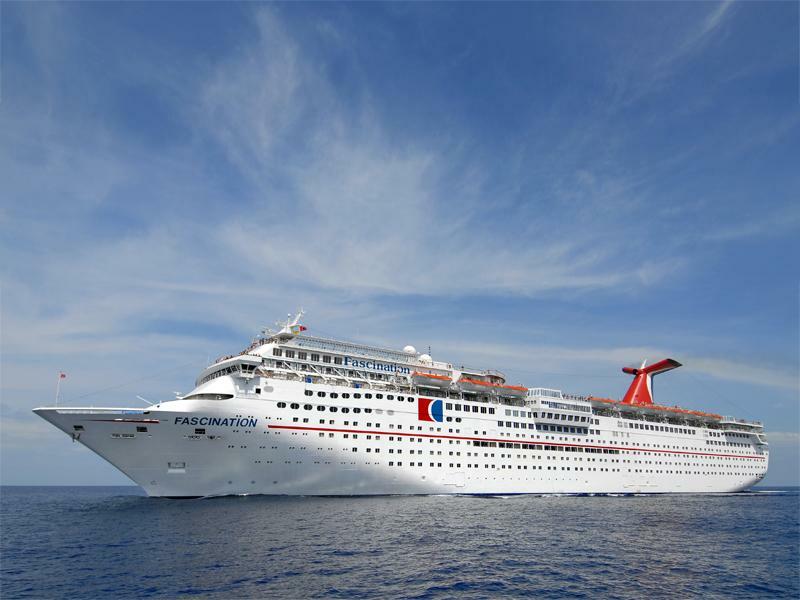 On 07May12 at 2351 a male passenger aboard the 855' M/V CARNIVAL FANTASY (O.N.8700773) fell and fractured his ankle while dancing as the vessel was transiting offshore from the Florida coast enroute to Charleston, SC. 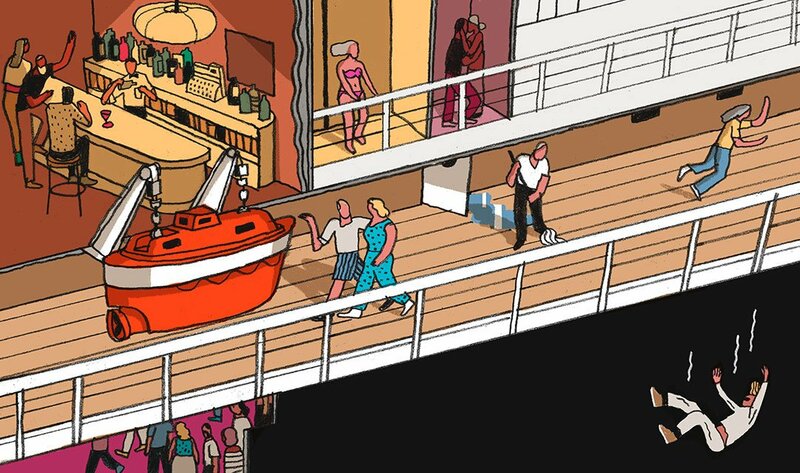 The passenger was participating in a guest deck party and group dance on the Lido deck stage. While dancing he lost his balance and fell to his right side fracturing his right ankle. The passenger was taken to the ship's hospital on a stretcher and treated by two ship's physicians and the lead nurse. When the vessel arrived at Charleston, SC on 09May12, the passenger was taken ashore to Roper St Francis Hospital for additional medical attention. Because the injured person was a passenger, no alcohol or drug testing was conducted in accordance with MSM Vol V B7-5. 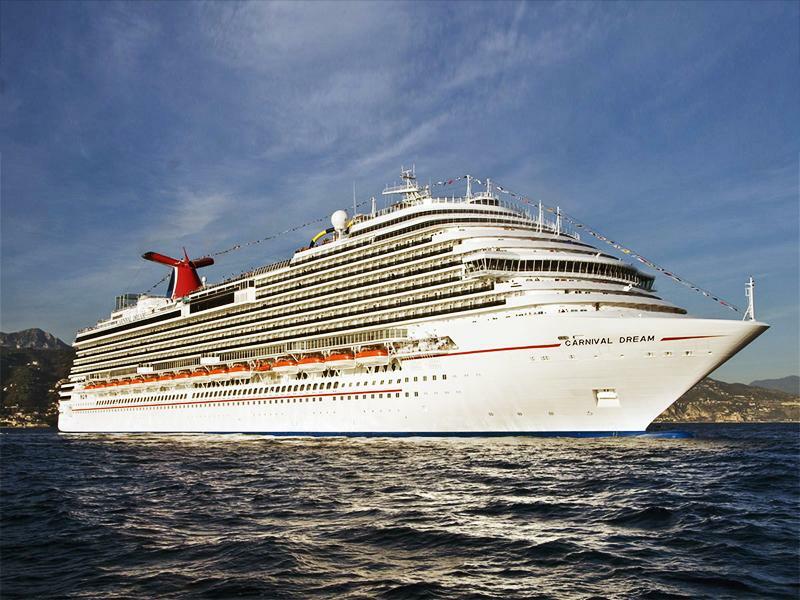 14 JAN 2012 - Passenger onboard CARNIVAL FANTASY injured when stepping out of the cabin bathroom. Passenger was reported to be intoxicated, no damage or pollution reported from the vsl. CARNIVAL FANTASY suffered a malfunction with a power supply to the port speed control computer (SCC). During pre departure checks, a LED indicator notified the E/O that the unit wasn't working properly, so unit was replaced. After being replaced, the system still showed insufficient power supply to the SCC, and the replacement unit was shown to be the source of the problem. The vessel's Classification Society was notified and cleared the vsl to depart the Bahamas on one shaft and a technician was scheduled to meet the vessel in Charleston to determine what was causing the units to fail. During the transit to Charleston, the replacement power supply was removed and a new unit put in its place, and verified working properly by crew. A systems check determined that SCC was functioning properly. Class was again notified that problem was resolved and the vsl entered Charleston under full power. On 17 October, CG investigators boarded vessel in port , spoke with crew, and verified system was functioning properly. All systems were verified by the Classification Society inspector as repaired and functioning properly. 24 AUG 11 - Passenger onboard CARNIVAL FANTASY suffered an injury when the passenger tripped and fell on the left side of her body. The extent of the injury could not be determined by the medical officer because the vessel's X-ray machine was not operational. Once the vessel docked, four personnel from the Charleston Fire Department, two paramedics, and a CBP officer boarded the vessel and proceeded to the injured passenger's stateroom. The injured passenger was then taken to the Medical University of South Carolina for X-rays. No damage to vsl or pollution reported. The extent of the injury was a hairline fracture on the left side of her pelvic bone. 19 AUG 2011 - Passenger onboard CARNIVAL FANTASY pronounced deceased, cause of death determined to be natural causes, liver failure. No damage to vsl or pollution reported. 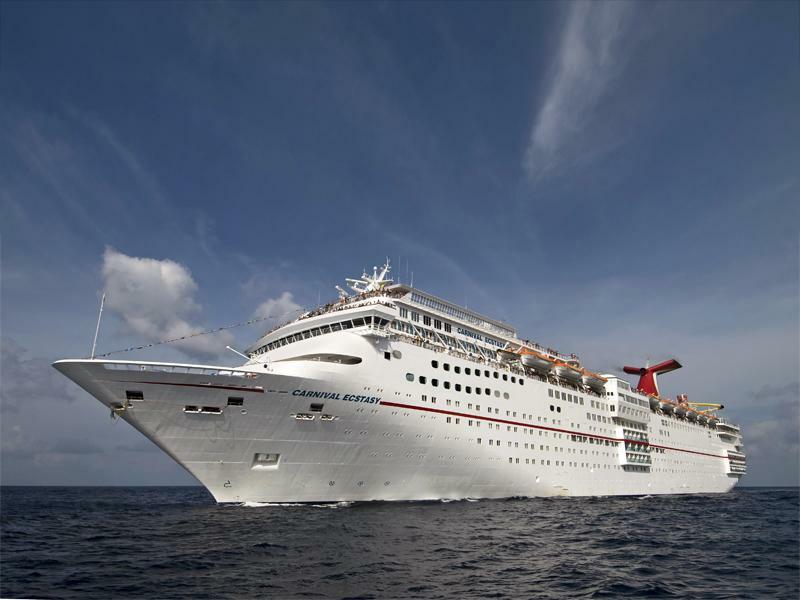 12 JUN 2011 - Passenger onboard the CARNIVAL FANTASY was pronounced deceased by the ships physician due to suspected heart attack from a pre-existing condition. No damage to vsl or pollution reported. 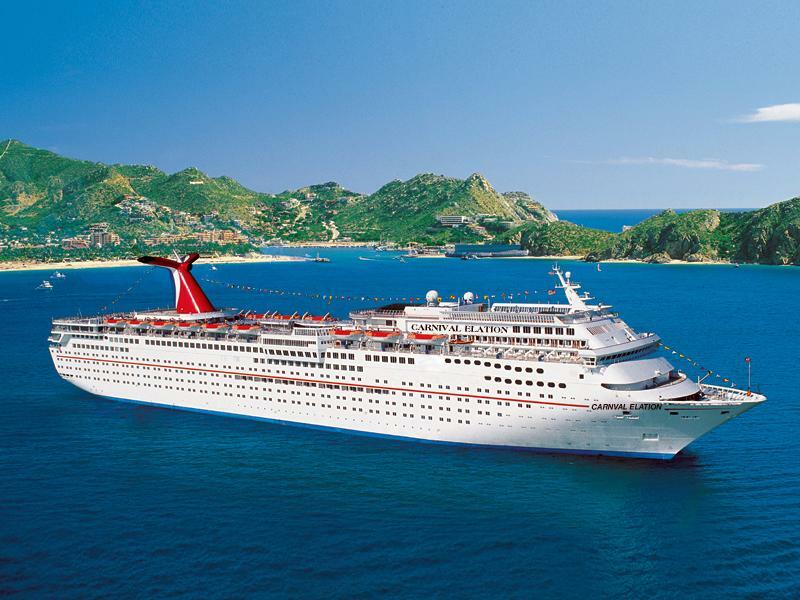 12FEB11: A female passenger onboard CARNIVAL FANTASY tripped and fell, suffering a broken femur to the right leg. A metal threshold of a door on deck12 forward stbd side reportedly caused the trip. The passenger disembarked the vessel in Charleston, SC, and was taken to local hospital for treatment. Drug & Alcohol testing not conducted as it was determined not to be a causative factor in the incident. No pollution or damage to vsl reported. 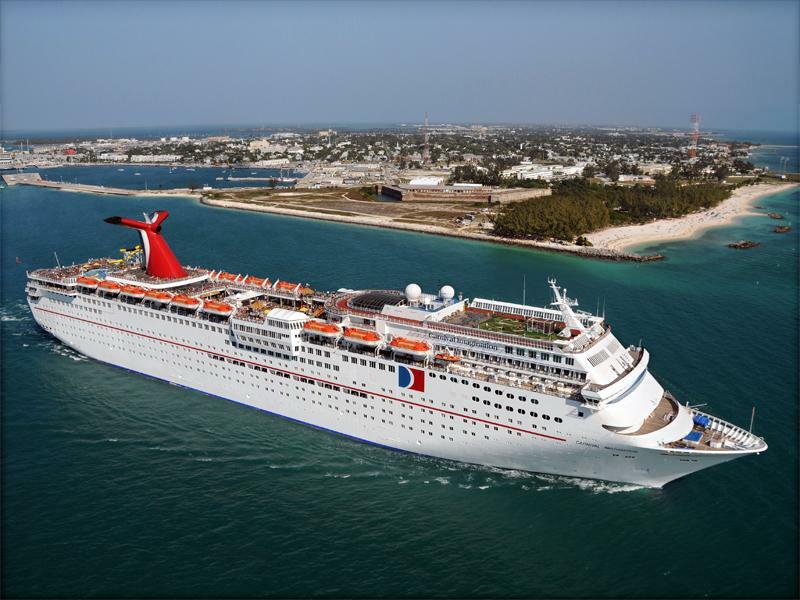 Cruise ship CARNIVAL FANTASY notified that Coast Guard that one of the passengers on board, a male, was complaining of chest pains. Vessel was near enough to shore that they diverted and transferred passenger to a Miami Dade Fire Rescue boat for medical attention ashore. No drug or alcohol tests were conducted for the crew because no crew member actions or inaction contributed to the occurrence of this marine casualty. This investigation is being downgraded from an informal level to a data collection level as it was determined that this personnel casualty was caused by a prior existing medical condition. 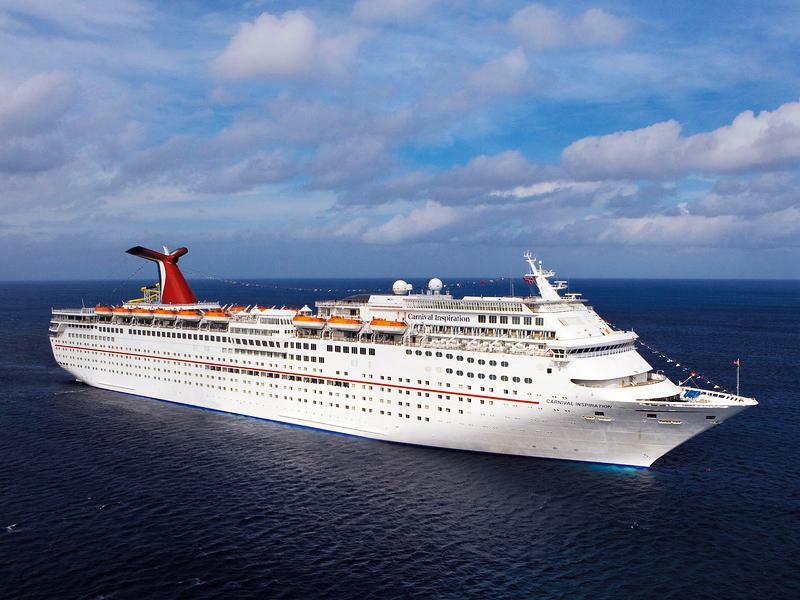 30AUG10: A passenger aboard the M/V CARNIVAL FANTASY died of natural causes as reported by the vessel's physician while transiting the Bahamas. The passenger received immediate medical attention but was unable to be revived. 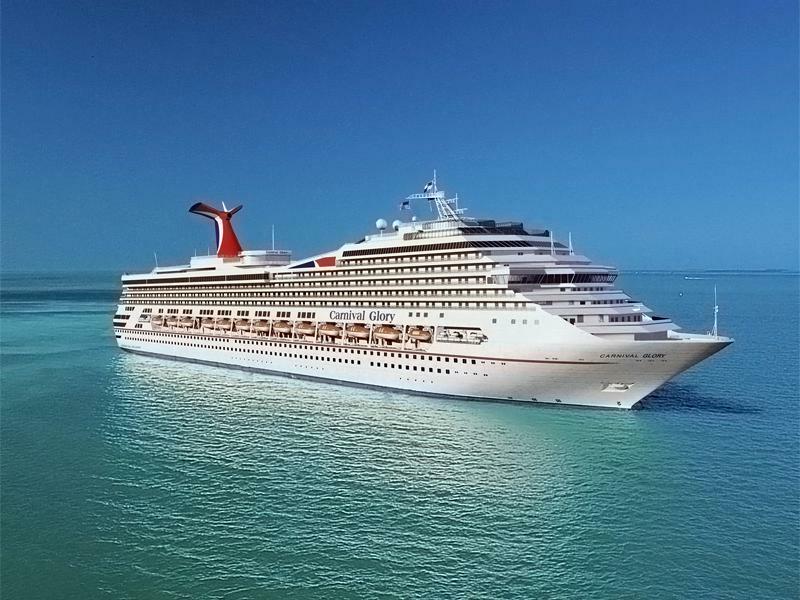 16JUL10: A passenger on board the M/V CARNIVAL FANTASY died on board from a probable acute myocardial infarction while the vessel was enroute to Charleston, SC from Nassau, Bahamas. The subject had a history of heart disease and other medical ailments. Cause of death is natural. On 26 December 2009, at approximately 1700, the Cruise Ship CARNIVAL FANTASY was hoisting one of its life boats in preparation to leave its port call in Cozumel, Mexico. The crew had been having problems with the winch, but finally got it working. As the life boat reached the davit stoppers, the limit switch failed and the winch continued to put tension on the davit. The tension caused a failure of 2 pulleys and the sheave shaft as well as causing the life boat to fall about 2 feet. The life boat was raised using chain falls and the CARNIVAL FANTASY was cleared to leave after reassigning passengers to different life boats. No further incident.